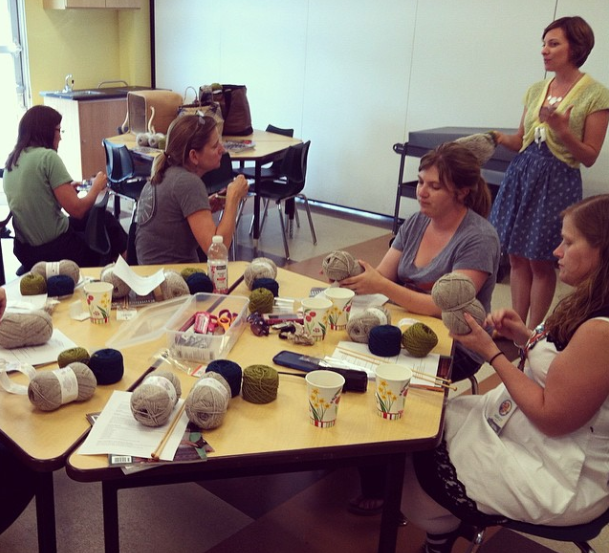 I recently had the pleasure of teaching a Buff Knitting class at the Fort Collins Museum of Discovery. This was done as a part of their Stitches in Time Series. If you are local to the area and interested in fiber arts, I encourage you to look into this great series. Earlier this summer I took a class on natural dyeing and it was incredible! 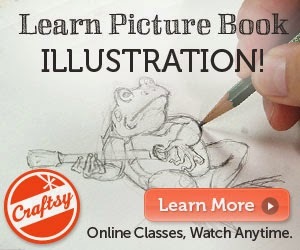 The teaching space is beautiful, the instructors were a wealth of knowledge, all materials were included, and at $25 per class you simply can't go wrong! 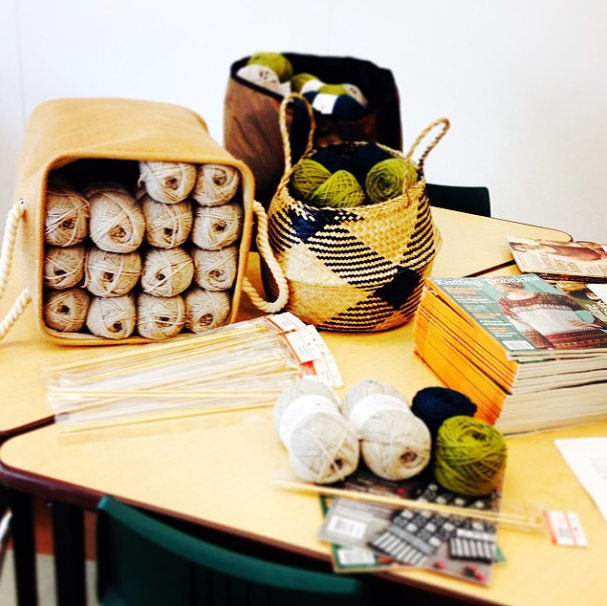 Here you see the materials table for my knitting class. I first became interested in Buff Knitting about three years ago. While visiting family on the east coast, my mother and sister and I started looking through an old issue of Adirondack Life magazine that had an in-depth article on this unique regional technique. After some time of reading, research and swatching, I was asked to write an article for Knitting Traditions magazine about Buff Knitting in the Adirondack High Peaks Country. The Fort Collins Museum reached out to Interweave this winter to set up a historic knitting class for their stitches series, which is how I was invited to teach. After working with a variety of yarns, needles, and stitches, I developed my interpretation of the Buff Mitten into the sample you see above, called the Timber Mitten. In this pattern, I combine a respect for the traditional natural or "buff" colored wooly mitten, along with a more modern stitching style that requires working with just one strand of yarn at a time. The Timber Mitten pattern is now available for sale in my Ravlery shop in case you are interested in trying your hand at it. The pattern includes written instructions, a colorwork chart and an instructional video on working the loop stitch. 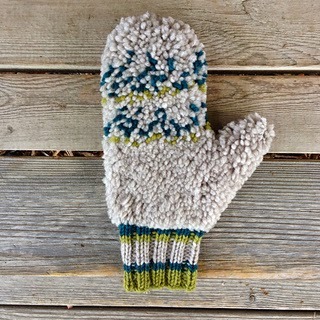 To create a buff mitten, you knit a loopy stitch mitten and then cut the loops. The cut loops are then "shagged" to create a thick and warm carpet like mitten, which was perfect for the loggers and teamsters of the north country to wear while working long hours outdoors in the winter. I am looking forward to wearing my mittens this winter on my long walks around the lake!